The structural insulated panel (SIP) is emerging as a unique alternative building technology for building envelope construction. It provides efficient solutions to such concerns as energy efficiency and dwindling natural resources. SIP technology is not new. It was used in residential construction as early as 1952, when Alden B. Dow, son of the founder of the Dow Chemical Company, began designing SIP homes. The first of these was built in Midland, Michigan that year, using foam-core SIPs for exterior walls, interior partitions, and roofs. They are still occupied today. According to a recent study prepared for the Structural Insulated Panel Association (SIPA), SIP production in the US in 1991 was 15-million square feet, equivalent to all the walls and roofs in about 4,000 homes. According to the study, this rate is expected to grow to levels ranging from 50- to 112-million square feet by the year 2000, depending on the aggressiveness with which the industry markets its products. SIP technology is a viable alternative to conventional "stick-built" systems, offering excellent strength and structural performance, and superior energy efficiency and environmental attributes. Although product types vary in the industry, the common characteristic of all SIPs are two exterior skins adhered to a rigid plastic foam core Panels are available in a variety of sizes and thicknesses depending on application requirements, from two inches to twelve inches thick, and in sizes from the standard four feet by eight feet to eight feet by twenty-four feet. This is ideal for their primary application: the exterior walls and roofs of low-rise residential and commercial buildings. The skins of a panel can be of the same or differing materials. The faces most commonly used are oriented strand board (OSB), waferboard, plywood, sheet metal, and gypsum board. The rigid foam cores are composed of expanded polystyrene (EPS), extruded polystyrene (XPS) or polyurethanes or polyisocyanurates. Expanded polystyrene is most commonly used because of its low cost. However, EPS cores must be made thicker to be equivalent to the higher insulating properties of other foams. SIPS are factory fabricated under controlled conditions, usually subject to a continuous program for quality control and supervision. Manufacturing techniques vary among companies. However, two assembly processes are most prevalent; adhesive-bonding and foam-in-place. Adhesive-bonding is achieved through the application of a structural-grade adhesive to both sides of the unfaced, pre-formed foam core. After the adhesive is applied, the rigid foam core is placed on top of a clean sheet of facing material and the second panel is positioned on the opposite side of the insulation core. Pressure is applied to the newly formed panel for some duration. Panels are them set aside until the adhesive has completely cured - about 24 hours. 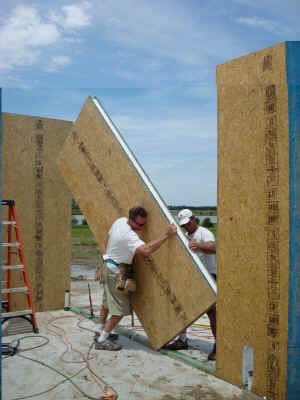 With the foam-in-place method, the facing boards are held apart by panel framing or specially-made spacers. The chemical components of the foam core, together with a blowing agent, are combined and forced between the braced skins. The expanded insulation material forms a bond with the acing material without the use of any adhesives. SIPs are capable of sustaining loads typically imposed on walls, floors, roofs and other load-bearing elements. They are essentially stressed skin panels; the cores of rigid plastic foam provide shear strength, and the exterior skins of structural materials provide tensile and compressive strength. A panel's structural composition can be compared to that of an I-beam. The panel skins are analogous to the flanges of an I-beam while the foam core is comparable to its web. The complete assembly, with exterior and interior faces properly laminated to the foam core, allows for a system that is structurally superior to conventional stud frame structures. Panels used for exterior walls are load bearing and can be used to form the entire wall (or they can be applied to framing as non-structural exterior insulative cladding or as a curtain wall). A load-bearing wall panel has superior axial load-bearing capacity; i.e., the strength to support vertical loads from the roof or floor above. A conventional framed wall is designed to support these vertical loads only through its studs. The exterior sheathing, if plywood, provides no contribution because it must have gaps between sheets and is not continuous. Other forms of sheathing are also discounted for the same reason. On the other hand, the SIP's sheathing can use all its capacity to support vertical loads because it is prevented from buckling by continuous reinforcement by foam core. The uniform, consistent composition of a SIP, with supportive sheathing on both sides of the core, is superior to a frame wall in racking resistance. The SIP's sheathing is adhered to the foam core over the entirety of the panel and edges are fixed to splines, which results in the development of excellent racking resistance. This characteristic is an important attribute for resisting earthquake and hurricane forces. SIPs exhibit other superior structural/strength characteristics. They are highly resistant to local loading. This is evident when one "thumps" a wall panel. The SIP will exhibit a uniform solid sound across the whole panel, whereas the frame wall will sound hollow between studs. This means that fasteners with proper anchors for railings, cabinets, fixtures, wall-mounted brackets, etc. can occur anywhere in a SIP wall, but only at studs or other reinforced locations in frame walls. A SIP wall has great resistance against buckling and bending when compared to equivalent conventional stud construction. This means that a taller wall can be built without increasing wall thickness, or that a wall can resist greater perpendicular loads from such forces as hurricanes. The structural superiority of SIPs is as beneficial in their roof applications as when they are used for walls. Flat or sloping roof panels can be stand-alone structures, like wall panels, or can span between framing members, like rafters. When they form a sloping roof they naturally create a cathedral ceiling on the interior. In bending, the thickness of the foam core, together with its shear strength and its bonding to sheathing, dictate and limit the spanning distance. Similarly, the depth of rafters limits conventional roof spans. The horizontal loads imposed on buildings, by earthquakes or extreme winds, can be effectively resisted by the roof acting as a diaphragm. This two-dimensional structural continuity provides as well rigidity and stability to the building as well as creating an uninterrupted layer over supporting beams or bearing strength necessary to withstand live (snow) and dead )roofing and equipment) loads, they usually can span freely from the ridge beams or purlins. If greater rigidity is required, SIPs may be manufactured with increased bending strengths and reduced deflection. In addition to wall and roof panels, SIPs can be used for floors and foundation walls when designed for these specialized applications. SIP strength characteristics are able to provide superior building performance partly because of tight connections at the joints between panels, as well as the connections between panels and such other adjacent structural elements as beams, purlins, and columns. There are several common wall panel connection methods used by SIP manufacturers today. A conventional approach involves fitting a 2x4, 2x6, or larger "two-by" (2x) spline having the same depth as the foam core, between panels and securing it to the facing material. Each panel edge is prerouted to fit half of the width of each spline. The 2x splines use readily available lumber and provide stability. With the double 2x connection approach, the splines themselves bear the building loads. This makes the system, with appropriate headers installed, a cohesive post-and-beam structure. The thin spline approach involves fitting two thin splines. approximately 1/2-inch to 3/4-inch thick by three to four inches wide, laterally into pre-routed groves in each panel edge. Each spline is usually double glued, stapled or nailed, and caulked at the seam between panels. No single connection method has proven superiority over others. Each one has its own merits. Individual panel manufacturers recommend the method that is most suitable for their system. Rough openings for doors and windows can be pre-cut at the factory or easily cut on site. Headers must be installed for window or door openings of more than four to six feet and can usually be eliminated for smaller openings. The normal technique consists of routing out approximately 1 1/2 inches of foam around the perimeter of all rough openings for 2x framing installation. The framing works effectively as a mailing surface. When nailed to panels above rough openings, the framing let into the panel adds to the box beam effect. To accommodate electrical wiring, most panels come equipped with pre-routed electrical wiring chases. These chases create a network of cored-out space through which wiring can be run from the building exterior or basement up through walls and floors to the attic. Wiring chases are pre-drilled vertically at panel edges or horizontally at pro-determined locations above the finished floor. Receptacle outlets and switch boxes are usually attached to the interior facing material. The foam plastic core of a SIP provides its insulating properties. Depending on the type of foam used (e.g., EPS, XPS, polyurethane or isocyanurate), R-values are in the range of approximately 4 to 7 per inch of foam thickness. This results in superior energy performance characteristics in walls and roofs. For example, a 4 1/2 inch thick SIP wall is often used as a substitute for a 2 x 4 stud wall, also 4 1/2 inches thick overall. Both have 3 1/2 inches of insulation. The SIP wall has insulation R-values in the range of 14 to 25, whereas the stud wall with fiberglass or mineral wool only has R-values of 11 to 15. The overall R-value of the stud wall must then be downgraded to take into account the part of its are taken up by framing, where there is no insulation. This is significant - 15 to 18 percent. The core of a SIP, which usually has no stiffeners between splines. is filled entirely with rigid foam. Moreover, when compared to stick-built structures SIPs have fewer gaps, less settling or compression, less moisture absorption or dust saturation and fewer cavities that permit convection or air circulation. All these characteristics would reduce insulation performance. The results are evident in both quantified and empirical data. For example, the overall R-value of a conventional wall with 2 x 4 studs and 3 1/2 inches of R-13 fiberglass, as indicated in the Thermal envelope compliance guide to the Model energy code, is R-13.1. An equivalent SIP wall with 3 1/2 inches of extruded polystyrene foam (R-value = 17.5) is R-20. But these quantified figures do not tell the entire story. In the real world SIPs appear to outperform the conduction resistance of conventional walls even if they are assumed to be the same in R-values. This may be due to the differences items that are not included in R-value calculations, like gaps, moisture, dust, settling and others. This was clearly illustrated in a recent field test conducted by the Florida Solar Energy Center (FSEC) under sponsorship of the US Department of Energy. Two identical houses were build side by side in Louisville, Kentucky. They were built simultaneously by the same builder. One had conventional framing, the other was built with SIPs. However, wall and roof thicknesses were adjusted so that both had the same calculated R-valued. Both houses were monitored for heat loss performance, and SIP house dramatically outperformed the frame house. More importantly, efforts to forecast seasonal heating energy savings showed a 14 to 20 percent savings for the SIP house in Kentucky's climate. In the published report, the researchers stated that "...there seem to be other factors, which remain unaccounted for, which cause the panel house to use less heat energy." Homeowners throughout the US are experiencing benefits through lower heating costs, reduced-draft houses and greater comfort. Numerous SIPA members, for example, have cited testimonials from owners of SIP homes whose fuel bills have been 40% TO 60% below those of conventional construction homeowners. It is widely recognized by energy performance specialists that some foam plastics are subject to "thermal drift", or out-gassing of blowing agents from foam cells over time. As a result, the R-value of these cores falls gradually until the thermal drift ceases to have an impact, and there is no further degradation. EPS cores are not subject to thermal drift and their R-values remain constant. Other foams, although higher in R-value than EPS, do drift over time. XPS cores have R-values of 5 per inch, listed widely for design values, indicating that this the long-term constant after all thermal drift adjustments. Producers of other foams also quote R-values at the fully aged rate, but exact values need to be confirmed by designers. Unlike fiberglass batts, SIPs are resistant to moisture absorption. Although every attempt should be made to ensure that the panels are kept dry, SIPs will retain their R-value even if some moisture absorption does occur. Wood-frame walls are required to have vapor barriers installed "on the warm side" of fiberglass or mineral wool to prevent water vapor penetration, which may condense and degrade insulation performance. SIPs do not need vapor barriers at all because moisture does not materially affect performance. In reality, except in such extreme climates as those in Florida and Alaska, it is difficult to identify "the warm side" of fibrous insulation. In Virginia, for example, the warm side is on the inside of the wall in the winter and on the outside in the summer. In Colorado, it can be on the inside at night and the outside by day/ Whenever the vapor barrier is on the incorrect side, water vapor can penetrate and degrade the insulation. Because of nail holes, minute cracks, holes in framing for wiring, cutouts for receptacles and other penetrations, it may be virtually impossible to prevent water vapor penetration of fibrous insulation; a concern non-existent with SIPs. The foam core in a SIP extends uninterrupted in all directions throughout the entire panel, which can be as large as eight feet by twenty-four feet in area. Breaks in the foam insulation occur less frequently, usually only at panel connections, which are few, or at openings. A frame wall has connections wherever the sheathing or drywall joints occur every four feet or so. And, because of the nature of panel assembly, the foam is tightly packed against both sheathing faces and perimeter joints. SIPs form structural envelopes that are extremely tight against infiltration of air, a major source of energy loss. This is primarily due to the large uninterrupted areas of insulation in panels. In frame walls there are not only frequent joints between sheathing at studs (a weak link in envelope continuity), but there are nail or screw penetrations at every stud and on both sides of the wall. Moreover, common points of leakage such as electrical outlets, vents and other envelope penetrations often are more difficult to seal in frame structures. Even if these penetrations are poorly sealed in a SIP structure, the insulation performance is not compromised by air circulating into the insulation cavity. This results in exceptionally tight SIP houses, when compared to framed structures, That exhibit very low levels of air infiltration with resultant increases in building energy efficiency and interior comfort. In the FSEC test in Kentucky, the SIP house proved to have a natural infiltration rate of 0.21 air changes per hour. This compares remarkably well with the average for new houses, in the range of 0.5 to 0.7. But more importantly, it is even lower than the recommended minimum of 0.35 (according to ASHRAE Standard 62-1989). Further, it may require a fresh air ventilation system to provide make-up air, according to FSEC researchers. Large differences in air infiltration rates can have dramatic impacts on energy consumption. For example, a difference in air infiltration rates of 0.4 air changes per hour (0.21 versus 0.61) between a SIP house and a conventional house can represent fuel consumption savings in the range of $95.08 per year (in Texas) to $180.66 per year (in Minnesota) for a 1540 square foot house. Some people may question why one would build a very tight house and then install a fan to ventilate it. It is important to understand that relying on random leaks in the building and unknown pressure forces due to wind and temperature does not assure adequate ventilation. Thus it often leads to over-ventilation and high energy bills or under-ventilation with possible moisture and health concerns. Further, with leaky duct systems, there can be pressure imbalances which can cause heating systems to malfunction, resulting in health and safety problems. SIP construction can be considered an engineered system. Innovation in the plastics and wood products industry is largely responsible for the rapid growth of new products now used in SIPs: first plywood, and since 1980 oriented strandboard. The development of these products has a common goal - the need for conserving scarce resources and providing for the optimization of the forest. SIP technology allows society to utilize forest products which are fast growing and thus renewable. Panel manufacturers are able to remove the strength-reducing characteristics of wood (i.e., knots, splits) and produce superior engineered products. This turns moderate cost low-quality hardwoods and plantation thinning into superior structural building components. As a result, a greater amount of the tree is utilized, and less wood fibers are used to produce a more consistent product than that used in conventional framing. Quality monitored manufacturing systems allow SIP producers to enhance the environment through the efficient use of valuable resources. Systematic design and production techniques significantly reduce process and construction site waste, requiring less landfill disposal, contributing to our country's resource and solid waste management goals. Designers can optimize the building design using SIPs, resulting in more efficient utilization of construction materials. SIP openings for windows and doors are often pre-cut at the factory reducing the expense of debris disposal from a job site. During panel manufacture, the foam core materials are optimized for the particular application. Waste materials are limited through creative design and resource management. Sometimes leftover panel pieces and scraps are used for do it yourself retrofit applications. Often, unused foam which may be generated in the manufacturing process can be returned to the foam manufacturer who can reprocess it into appropriate applications or send it to a recycler for further reprocessing. Recycling is one method for handling waste. However, if recycling is not a satisfactory option given a site's geographical location, foam plastic can be safely landfilled. SIP foams are stable and will not biodegrade or create leachate or methane gas, the two major problems with all landfills. Construction materials are often used in "stable landfills" where the ground is later reclaimed for parks, stadium and other similar applications. In addition, Sip foams can be safely incinerated at regulated waste to energy facilities. Its energy value (greater than some soft coals) can provide a secondary fuel source for greater savings to the local utility company. EPS burns cleanly, and produces almost no toxic ash. It does not require hazardous landfill disposal. The issue of air quality is a concern to the public, regulating agencies, SIP producers an foam manufacturers. EPS foam cores are produced using materials which have never had any adverse effect on the protective stratospheric ozone layer. Most, if not all polyurethane foam core producers have now switched from CFCs to HCFCs. HCFCs are blowing agents with substantially reduced ozone depletion potentials. All US extruders of polystyrene foam switched HCFC-142b by 1991, two years ahead of EPA deadlines for CFC phase-out. HCFC-142b is 90% less harmful to the ozone layer than its predecessor, CFC-12. Plastic industry members are working to exceed current and future air quality standards through improvements in materials, processing and control equipment. Noise pollution, the introduction into buildings of unwanted sound, is another form of environmental pollution that concerns many people. SIPs are excellent barriers to airborne sound penetration. This is due to the combination of their closed construction (no air movement in the panel wall) and extremely tight joint connections.